Members of CMA visited an eco-friendly life skill development camp on 14th October 2017.The campsite is located at a place in the serenity of forests – right in the Shivalik foothills. More than 70 persons participated in this camp. 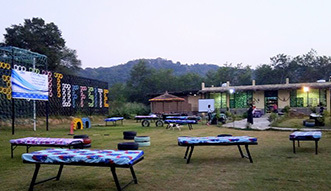 At The Great Offsite a team of experts orients the visitors with life skills in the areas of management and behavioral aspects and tests their latent talents. They make the learning process effective through field visits and live experiences (for instance: upcycling & recycling). CMA encouraged promotion of local handicrafts by arranging free stalls for the local artists of surrounding villages at the campsite.